Diaz’s late-’90s short story, “The Sun, The Moon, The Stars,” is still one of my favorite short stories of all time: a fantastic and gritty voice, a real sense of conflict inherent in even the most mundane of everyday details and activities, and a compelling sense of inevitable doom for the everyman character, from page 1 to page 20. 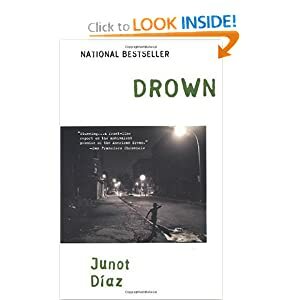 And since I read that story several years ago, I’d formed great hopes for “Drown,” his critically acclaimed (and some say “canonical”) collection of immigrant narratives, detailing the struggles of Dominicans abroad and in the streets of the U.S. Overall, I was a bit disappointed, to be completely honest. Perhaps this is one of those cases of a book built up with such great hype and expectations that the reality can in no way compare with my imagined ideal of a book…but really, I think that much of the hype is unwarranted, or is unfairly lavished upon the entire collection, when really only a couple of the stories are great. The first story, “Ysrael,” is indeed superb, and establishes that rich and gritty voice that I loved from “Sun…” But after “Ysrael,” many of the following stories seem to be pale sequels, the same characters repeating the same ideas in different situations. Yes, there are brilliant moments found here and there, but it’s the flip of a coin whether a story is actually engaging or memorable. And in a supposedly canonical book, that’s just not good enough. The final novella, “Negocios,” is the most powerful piece in the collection, and including it as the last piece is a shrewd move: it stays with you, in much the same way as an epic rock ballad (Think “Stairway to Heaven”) can make the overall experience of the album feel profound. But it’s just an illusion. “Negocios” is, after all, one of ten stories, and while it is the most significant and emotionally powerful, this shouldn’t detract from the five mediocre stories that preceded it. Diaz is an amazing talent, and I’ll always cite him as an influence. In fact, I can’t wait to read “Oscar Wao.” But I’ve got to be honest about “Drown.” It seems to be one of those books (and I’ve read quite a few) that literary critics are dying to praise because they want to hail a writer as being “The Literary Voice of Dominican Americans!” or “The Literary Voice of Greek Americans!” Etc. Etc. Etc. But do we need a single voice to represent an entire nation, or an entire culture? Don’t we risk–as we do with Frederick Douglass, when we promote his memoir but ignore the hundreds of other slave narratives–making Diaz a token, instead of a true artist? And don’t we–by promoting this book as being something greater than perhaps it is–simply inflate an artist’s prestige in the same way as investors might try to increase the public’s view of a company’s prestige, just to make a quick profit before selling stock (inflation of price without any new production of “wealth,” in other words…the illusion of literary wealth)? Am I over-dramatic? Maybe. But don’t tell me that “canon” isn’t a very loaded, and very political, term. This entry was posted in Books - Contemporary. Bookmark the permalink.